i.e. 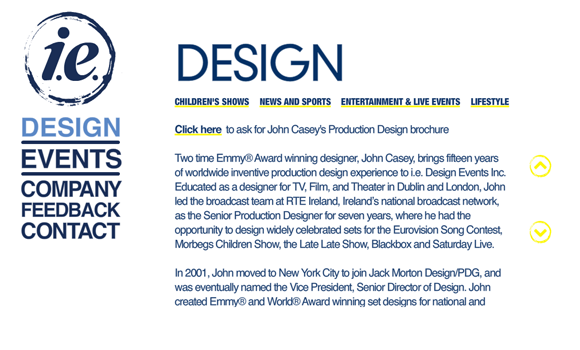 Design Events, the company of Emmy Award winning designer John Casey, has launched a new website. The site features many of Casey’s latest projects including news and sports designs along with various lifestyle and children designs. 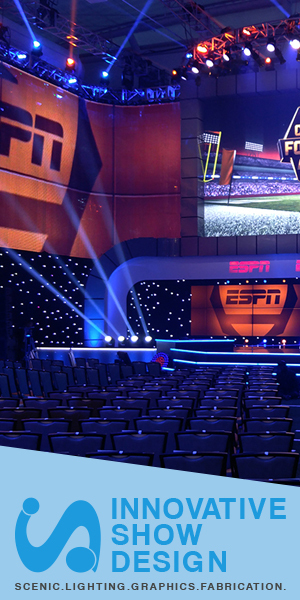 Some notable designs featured include: The Suze Orman Show virtual set, various Fox News studios, CCTV’s Washington D.C. and London studios and many unique concepts that have not been built. Casey won the 2006 and 2009 Daytime Emmy Award for Outstanding Achievement in Art Direction/Set Decoration/Scenic Design for his work on “Martha,” Martha Stewart’s daytime syndicated show. Casey also won a BDA World Gold Award for his Sky News newsroom and set in 2006.